Bitcoin isn’t dying, but it may be sick. Amongst the backdrop of increased user adoption and an all-time high price, the limited throughput of bitcoin has resulted in severe network congestion. The bitcoin network is bulging at the seams, a victim of its own success, and transaction fees are getting out of control. Every transaction on the bitcoin network is expected to pay a “transaction fee,” which is claimed by whichever miner processes the transaction. This creates a natural incentive for miners to serve the users of the network by actually processing transactions, instead of only focusing on generating new bitcoins for themselves. This incentive system also creates a sort of bidding war to determine whose transaction gets processed first. The total amount of transactions that can fit in each block is limited, and miners tend to prioritize the transactions that pay them the highest fee. Everyone wants their transaction to be included in the next block, and as a result, transaction fees have begun to skyrocket. We could write an entire blog post (or 20!) 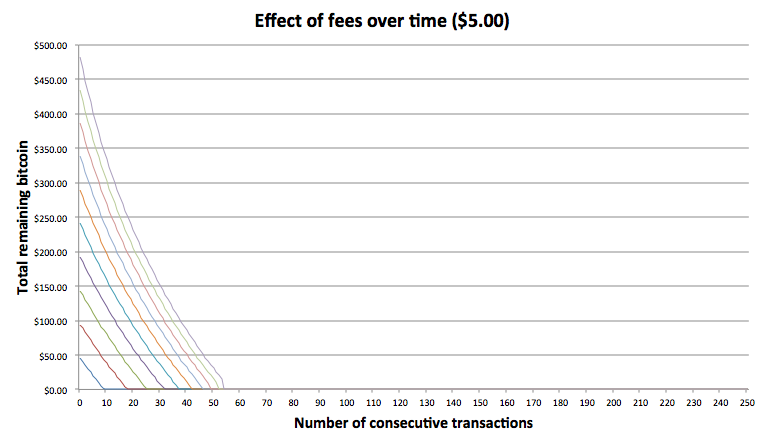 about the scaling issue and how bitcoin can evolve to serve more transactions per block, but for now let’s just talk about the effect of high fees on the bitcoin industry. To begin, let’s take a look at something we’re going to call “attrition.” Attrition is defined by the number of consecutive times an amount of bitcoin can be passed along before all of it ends up eaten away by transaction fees. For example, imagine that you start with $500 worth of bitcoin. Back in the early days of bitcoin, when fees were low, the attrition was insignificant. That means that the original $500 could be passed from user to user almost indefinitely. 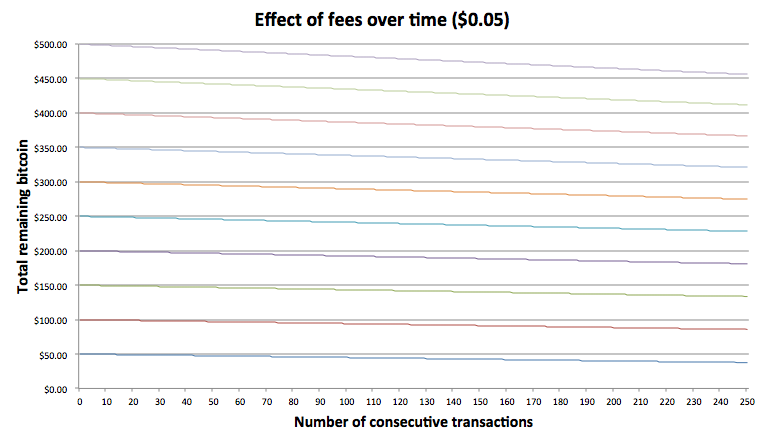 To illustrate this, we’ve created a chart to show what the attrition looked like when fees were around $0.05 per transaction. A quirk of bitcoin is that transaction fees are not charged based on the amount that you are sending, but rather by the size of your transaction in bytes. The most significant contributor of transaction size is the number of incoming transactions that you are pulling from when sending money. A good analogy would be to imagine that you are charged a 75 cent fee when paying with cash, but the fee is charged per bill. This means that if you pay with a single $100 bill, you would only get charged a fee of $0.75. But if you pay your $100 tab with five $20 bills, you would have to pay a fee of $3.75. This is important because from what we’ve seen on the real-world bitcoin network, larger value transactions are more likely to pull from multiple transactions and be larger in size, requiring a larger fee per transaction. We’ve factored this into our model, and although you can’t see its effect very well in the graph above, its impact will become more apparent as fees go up. As we all now know, the days of near-free transactions couldn’t last forever, and today we regularly see average fees in the vicinity of $1.30 per transaction. Although much higher than five cents, many people say this price isn’t quite the end of the world, and for many applications of bitcoin, it isn’t. But take a look at its effect on attrition. The first thing to note is that $50 worth of bitcoin wouldn’t even make it through 40 consecutive transactions before being completely consumed by fees. Needless to say, at this fee level $5 transactions are effectively pointless. A $5 purchase would actually cost you $6.30 after you pay for the fees, and the person you made the purchase from would only be able to spend $3.70 of it after paying their own fees to pass it along. The good news is that the bitcoin industry is resilient and will adapt to overcome these new challenges. The bad news is that these issues will take quite some time to resolve, and in the meantime high fees are gradually reducing the user’s ability to transact in bitcoin, which has a punishing effect on everybody. If things continue on their current trajectory, it won’t be long before we see average transaction fees of $5, which will have a remarkable impact on attrition, as seen below. Ironically, as the cost of sending bitcoin increases due to high fees, more and more users may be encouraged to hold onto their coins and not spend them. This could create the immediate effect of reducing supply and causing the bitcoin price to rise. On the surface this may appear to be a good thing, and recently the world has been abuzz with talk of bitcoin’s amazing increase in value. However, if high fees persist long enough, bitcoin may eventually become unsuitable for any purpose other than as a long term store of value. This is an important use case for bitcoin, but one that is less interesting and far below its ultimate potential. Many of our customers have approached us with complaints about transaction fees. In the worst cases, people trying to spend the digital equivalent of a basket full of $1 bills are faced with the prospect of paying, for instance, $75 in fees for a $100 transaction. It’s not a great user experience, to say the least. 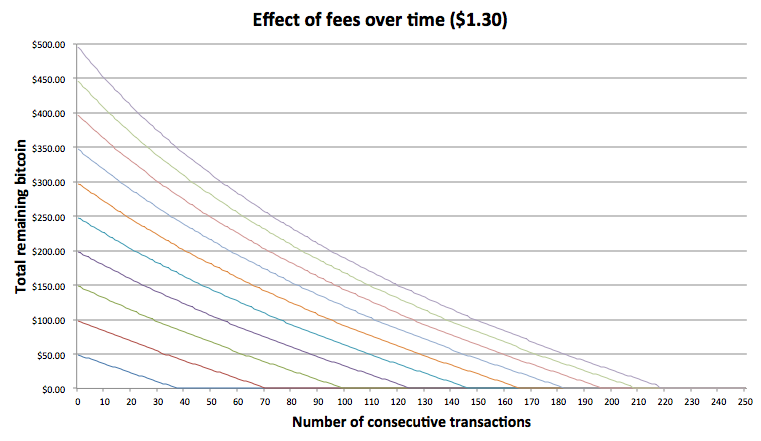 Though the future for bitcoin looks bright, the issue of fees cannot be ignored any longer.